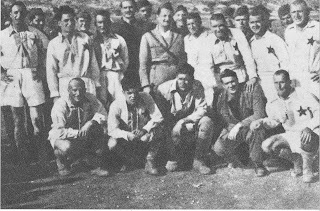 NK HAJDUK, 1944, with new red stars and friends on the island of Vis. IT was back in the days of the Austro-Hungarian Empire, in the years before the First World War. A group of Croat students attending the University of Prague went to the city's old U Fleku pub after watching a football match between AC Sparta and SK Slavia. They got talking about how popular the game was in their home city, Split, and how good their friends were, and decided Split ought to have a professional side. It wasn't just the beer talking, because soon after they met they had their club officially registered with the authorities, on February 13, 1911. 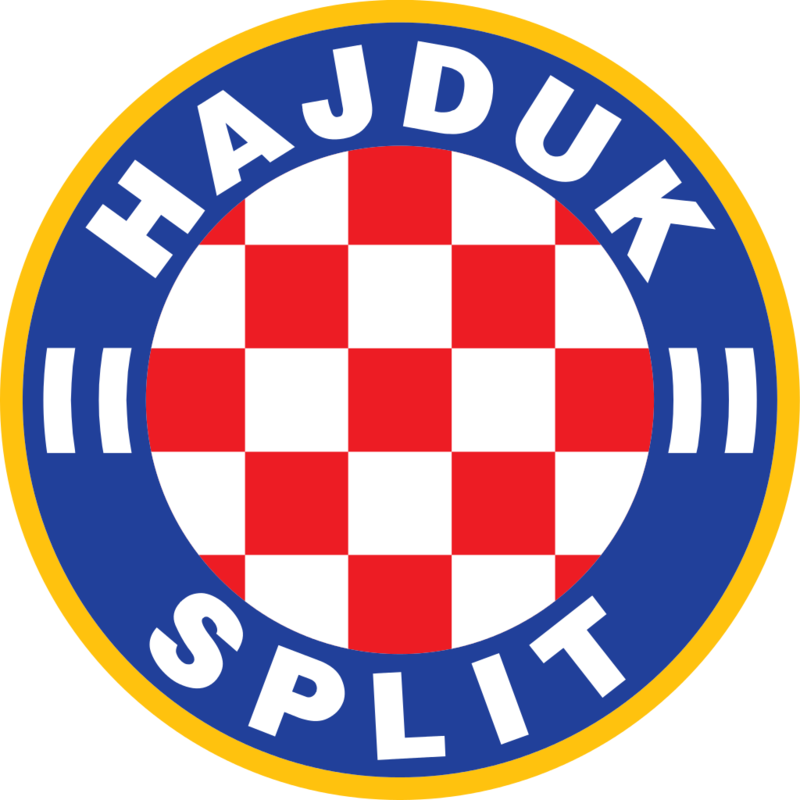 Thinking what to call their team they went to see an old teacher, Josip Barač, and he suggested "Hajduk", a name for a brigand, which had come to be romanticised and associated with guerrillas fighting foreign rule, whether the Ottoman or Austro-Hungarian empires. A famous hajduk called Andrija Simic had arrived in Split in 1902, after years in an Austrian prison, and been greeted by cheering crowds. Barač told the football club founders that the name "Hajduk" symbolized "that which is best in our people: bravery, humanity, friendship, love of freedom, defiance to powers, and protection of the weak. Be worthy of that great name." 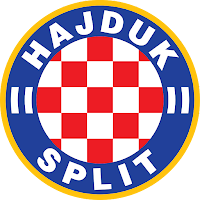 Hajduk described itself as "hrvatski nogometni klub" (Croatian football club) and adopted the Croatian chequerboard coat-of-arms in its crest, reflecting people's opposition to the Austro-Hungarian policy of keeping Dalmatia separate from the rest of Croatia. This issue would reappear in World War II, when in return for Mussolini's backing the Ustashe conceded Split and the rest of Dalmatia to Italian rule, while extending their own brutal regime over Bosnia and Hercogovina. Hajduk's first opponent had been Calcio Spalato, the club of an autonomist party from in Split, and their matches ended with a 9-0 (6-0) victory for Hajduk. Under the wartime occupation they were offered the chance to compete in the Italian first division as "A C Spalato", but turned it down, and they adopted the same defiance when the Germans occupied Split and turned it over to the Ustashe's NDH state. In the same year that Hajduk was founded, a young man from Kumrovec in northern Croatia went to work at a factory in Kamnik, in Bohemia, going on to jobs in Germany and Austria, where he ended up a test driver for Daimler. Of mixed Slovene and Croat parentage, his name was Joseph Broz, though he was to become better known in the Second World War by the nom de guerre, Tito. It was also in 1911 that the Serb journal Almanack published an article on Young Bosnia, and that a teenager called Gavril Princip joined the nationalist group. On June 28, 1914, Vidovdan (St.Vitus Day) to patriotic Serbs, in Sarajevo, he fired the shots which killed the visiting Archduke Franz-Ferdinand and his wife Sophie, and provided the pretext for the first Great imperialist war. Called up to the Austro-Hungarian army, Joseph Broz made Sergeant-Major. But more important than this military experience, he was captured by the Russians, then freed from a prison camp by revolutionary workers during the February Revolution, and went on to join the Red Guards and become a communist. Forward to September 1943, when news of the Italian surrender reached Tito's partisan headquarters in Bosnia, where they had already been joined by British officers, Churchill supporting them as the most effective if not sole force fighting the Germans in Yugoslavia. It was urgent for the partisans to reach Split, and take the Italian forces' surrender - and arms supplies -before anyone else, particularly Germans, got there. It would mean a forty mile journey across Hercogovina's rough terrain -"good only for raising sheep and Ustashe", as a Bosnian saying has it. The 1st Proletarian Division's advance force made it in a 24 hour forced march, much of it overnight, clashing with an Ustashe unit on the way and capturing weapons from them. When they reached the hills overlooking Split they saw a little old Fiat car winding its way up the zig zag road to meet them. "What kept you?" said the driver. He told them that Split was in the hands of its citizens, and that local partisans assisted by high school students had taken over and disarmed the Italians. General Emilio Becuzzi surrendered the Split garrison, consisting of "Bergamo" division, some 12-13,000 men, on September 12, 1943. Italian officers wanted to keep command of their own units, but this was not accepted. Instead, some 350 Italian soldiers who wanted to join the partisans were formed into the Garibaldi battalion - same name as an Italian unit in the International Brigade in Spain. (There's a memorial plaque honouring these Italians on the post office as you enter Split from the south). On September 15, in Livno, Herzogovina, the Matteotti battalion was formed, taking its name from an Italian Socialist MP whom the fascists murdered. More Italians joined the partisans in Montenegro, forming an entire Garibaldi Division which stayed in Yugoslavia until early 1945, when it's member were shipped back to Italy. Meanwhile in Split, while partisans used captured Italian vehicles to cart away weapons and ammunition, the British Captain Deakin made a balcony speech to citizens, with Croatian poet and partisan officer Lola Ribar interpreting, promising that as British and Allied forces advanced up through Italy they would be able to give more support to the liberation struggle in Yugoslavia. His speech was widely circulated by the resistance paper Slobodna Dalmacija (Liberated Dalmatia) - (which still exists as a title today, though President Tudjman and his business cronies put paid to its independence). A Nazi paper in Zagreb reported this as an "unfortunate speech made by a local Jew disguised as a British officer"). As for Hajduk, at a ceremony on their home ground, the entire football team lined up and pledged their allegiance to the partisans. The partisans could not stay in Split, where their presence made them and the civilian population prey to Luftwaffe bombing. The Germans took the city. But they could not have Hajduk. In 1945, Hajduk made a tour through Egypt, Palestine, Lebanon, where they were honoured by de Gaulle, Syria and Malta. 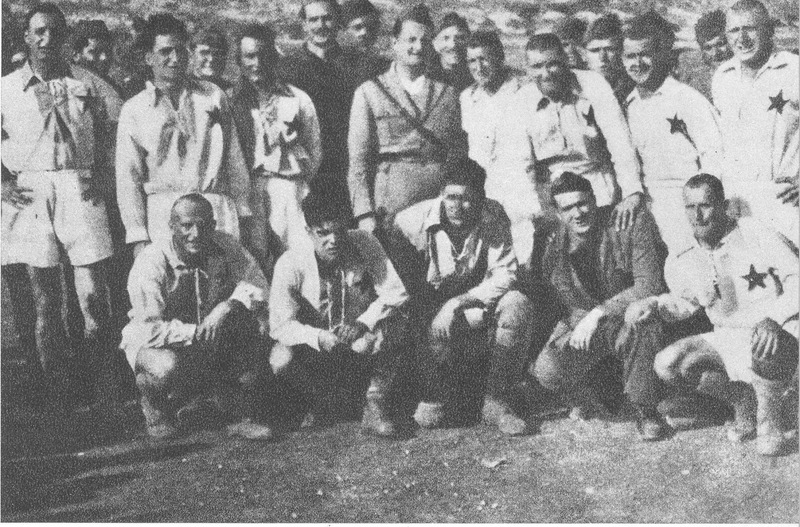 After the war, Tito, who frequently attended matches, invited his favourite team to move to Belgrade and become the official Yugoslav People's Army team. But they preferred to keep their "Dalmatian spirit" and stay in Split. And why am I recounting all this in my blog just now? 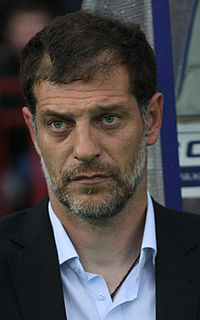 Well the other day I was talking to a comrade of mine who was over the moon because the football team which he supports, West Ham, acquired a new manager this month, Slaven Bilic, whom he describes as a "Socialist", and not like the owners. "The team's philosophy is 'power to the people.' There are no rich or poor here. No classes. That's why I can say that I am endeavoring for a socialist team." (Post-match interview after Beşiktaş beat Gaziantepspor 2–0 in Spor Toto Super Lig). Along with his native Croatian, Bilić is fluent in German, Italian, and English, while he also holds a degree in law. As a big fan of rock music, he plays rhythm guitar with his favored red Gibson Explorer and is a member of Rawbau, a Croatian rock group. In 2008, the band recorded a song for Croatia's performance at Euro 2008 called "Vatreno ludilo" ("Fiery Madness").Bilić has identified himself as a socialist, and has said "If you know to share what you own, you live happily and with honor. I am a true socialist. I know I can't save the world on my own; but if there is a struggle against unjustness, I always prefer to be on the frontline, and that is my attitude toward life." My West Ham mate reckons Bilic is bound to be a big change from Sam Allardyce, whom he replaces. Sounds like he is a change from most managers, though of course Fergie and Brian Clough have been outspoken Labour men. Sir Alex indeed has credited his early days as a trade unionist and shop steward in the shipyards with teaching him leadership skills. (not a fashionable background for Labour politicians in recent years). 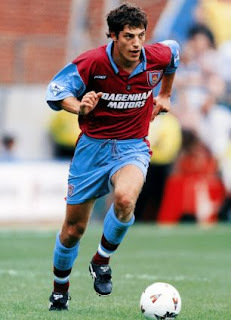 Both Hajduk and Slaven Bilic have had checkered careers as well as badges, and no doubt my mate's fanzine will be able to appraise what contribution the new manager brings to the Hammers' game as well as his politics, and what if anything it owes to his first club's heritage. Meantime I thought his arrival a good excuse to dig up a bit of history.